TempoPerfect is a Metronome that runs on your PC and can be controlled using your mouse or hotkeys. 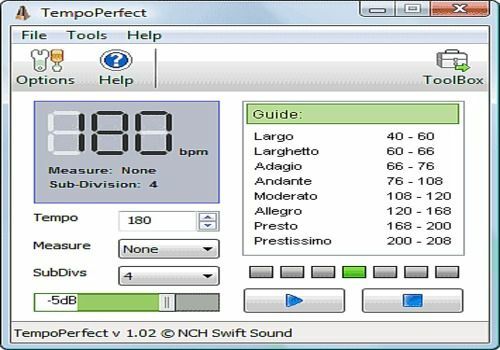 Unlike mechanical metronomes that wind down, TempoPerfect provides a clear and precise beat that can be acurately adjusted for the correct bpm.It features a visual beat indicator bar that bounces from left to right in time with the beat. This provides musicians with a very helpful visual cue and also includes a tempo guide in the main window.